We've compiled a top 10 list of the most widely available toy farm sets for sale with the UK, to buy online or in-store with prices and seller names included. Unlike timeless wooden farm sets for kids made generations ago, the big companies have taken over this sector so there are very few sets that will not be recognized as they once were - namely flat packed so self-assembly, or building bricks. 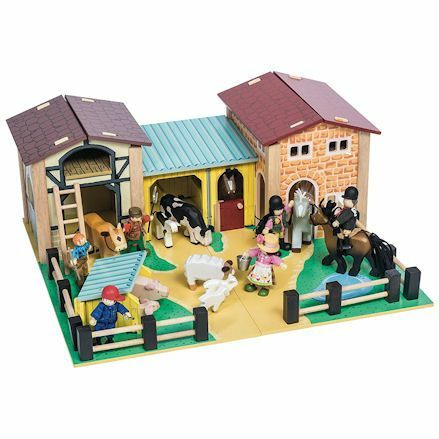 Though, there are nice self-assembly wooden toy farm sets available for just about every range of farm toys going, whether they are made exclusively for use within there own brand, or made to be used with multiple brands. You may not be able to pass down a toy farm you once owned as a kid, or even the one granddad made in the shed, but you should be able to pick out a favourite. You'll find Brushwood Toys own range more to your liking, with the only range still made here in Britain and compatible with hundreds, possibly thousands of 1:32 scale farm toys including; tractors, combines, farm animals and figures. Regardless, a few features still remain remain, including farmyard base that is colorfully finished, where the related building stand. This can be one of a tractor shed, sty, coop and a stable - a mix of the above. But of course no farm would be the same without being made from wood, so expect each set to be made from MDF or ply, with materials such as plastic and laminated cardboard also included. Remarkably, and a common sight with the farm set game these days are most toy farm are self-assembly, meaning you have to put it together before play. Known as flat-packed, all the walls, roof panels and divides are all laid out in the box, its up to you - as the adult - to build it yourself. Life is made easy thanks to easy instructions, but even better these self-assemble farm sets do no require screws and fixings - well maybe the occasional screw to two. They've built these farm sets where you only need to slot the panel into a corresponding hole on the opposite panel - which is very quick and easy to do. Largely made from MDF with fencing made from natural wooden dowels. No screws are included but sometimes hinges will. There's no glue but the patterns are printed on with just a dab of hand painted features. Several of our featured - mostly wooden toy farms - are made with the makers own brand of farm animals in mind, but it doesn't always work like that. What we mean is people tend to buy a set they like based on small or big farm animals toys the child already owns, so their mission is to find a compatible set. Take for example Schleich, Bullyland and Collecta farm animals, sure they supply a nice range of big farm animals, but they don't supply a home in the shape of a farm set. 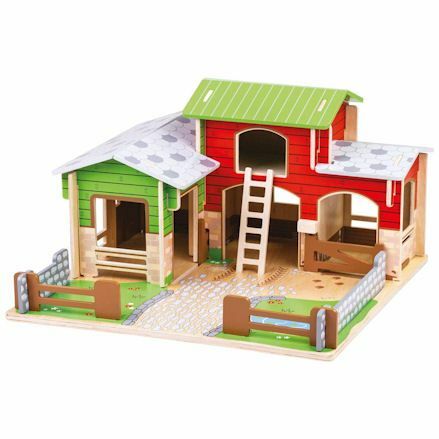 People may look to the big plastic or wooden toy barns available from these brands, but its a farm set needed with a barn included within the farm playset. Rather than use the makers own farm animals, just go with a big wooden playset that is sure to be compatible with the big farm animals they have now. If you're looking for a scale farm set then its more important than ever to find own that matches the scale you're looking for actually. It would be a 1:32nd scale farm by any chance would it? 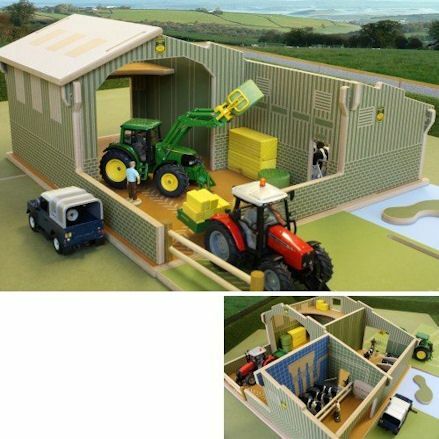 Because its these farm sets that are in high demand, thanks to the popularity of Britains 1:32 scale farm toys. Luckily for your makers own way ahead of the game, releasing several 1:32 scale farm sets compatible with both Britains and Siku tractors, vehicles, animals and accessories. Look to no other than Brushwood Toys - with a couple of sets featured - they have you covered with 1:32 scale with a range of fun and interesting farm buildings. Before we move on, you may be interested 1:16 scale sets, because this scale is far to large - farm sets don't exist. Instead you can look to 'self-assembly' buildings. Forget about bringing unrelated toys to the Playmobil and Lego farm sets because they just don't get along. What we mean is Lego and Playmobil farms are exclusively made for their own brand of toys only, as the special bricks and slot-in functions only work within the brand. Sure you could bring in there favourite farm toys from other brands and well they don't fit in with one another - including sizing - this should not stop kids using there freedom and should be free to explore there imagination. Just bare in mind Lego and Playmobil sets are not compatible with one another. And they certainly don't work with brands that make basic plastic farm animals and scale tractors; such as Britains, Bruder, Schleich and Breyer. If you have a Lego set then build up the collection with Lego only, likewise with Playmobil. But out of interesting, we do list a couple of sets from both brands in our list below. 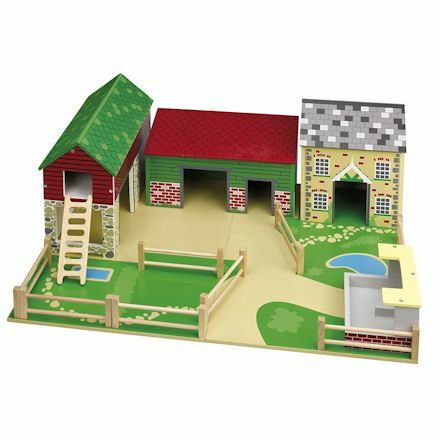 In our opinion, there are far more attractive farm sets out there than this Micki large farm, but we have to say why we like this one the most, and its not necessarily the design. Rather so the way it was built with popular farm animals or vehicles in mind. If only used for big farm animals, it works a treat. And will especially fit in with Schleich, Papo, Safari and similar brands. But then again, it can be used for 1:32 scale farm toys only, and you might find you could fit a scale tractor inside the shed. Micki have demonstrated the set (as featured in the picture) using big farm animals and a small tractor; we don't recommend this, pick a scale/brand and stick to it. Unfortunately, even with Micki's second try of producing a worthy toy farm, they have failed to produce this one in a particular scale. This is an updated version of the now discontinued farm set of the same name, only this one doesn't include a silo, but instead replaced with a more interesting working winch. With a Scandinavian design, it's made from printed MDF with slot-together buildings. Working parts include a sliding barn door and a crane but a flimsy mat. Comes complete with fencing but all accessories shown are sold separately. John Crane's very own toy farm comes under many names among them Tidlo and Branching Out, but you still end up with the exact same set. But why we like this farm so much and why it stands as our second favourite, is simply because when built, you get four individual farm buildings that can be used as laid out by Le Toy Van, or position as you please. Ideally the kids will use the baseboard as a boundary for play, with the fencing sections creating a secure compound for the farm animals. But here you can keep cows, sheep, or similar livestock one or two sheds, with the farm family taking up residence in the farmhouse. The layout of the farmyard base allows the animals to graze on the grassy patches, with a pond for a duck or two. Surround the grass patches with fence panels well the walkways are left for the people to wonder, or even reserved to drive a truck. Then in the corner there you can setup the pig sty within the self-contained building. The design on the MDF is printed with assembly required. Well the The Oldfield Farm comprises of a multiple farm buildings, there's also a ladder to access the hayloft. Early Learning Centre's second attempt at a farm following on from the rather to realistic theme, but very dull Cobblestone Farm. The ELC Brambledale Farm is far more colourful and appealing to the young ones. As usual it is constructed in a fairly slim, printed MDF with self-assembly required, with five farm building to construct, including a barn with hayloft, two stall stable, cow shed, pig sty and chicken coop. 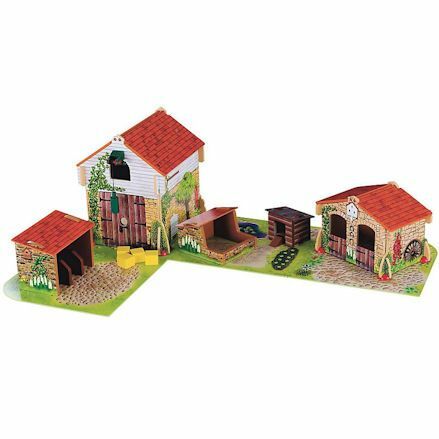 As usual, these wooden ELC farm sets comes flat-packed in small sections that you simply slot together but no extra tools are required for assembly. This all is positioned on a laminated, colorfully printed baseboard which also acts as the boundary for the farm, and can be move into different shapes. Both the barn with a working winch and the stable with two opening doors come with an hinged roof, well the rest of the buildings have easily removable roof panels. Early Learning have a set of farm animals and figures of there own to go with this set, but you might want to explore similar size farm animals too. Le Toy Van the Farmyard is all your need in a farm set, it has everything; from the base to the barn, the stable to the pig sty. But first it has to be assembled, which should be easy enough as there are little panels to slot-together, but going by product picture should be a huge help. 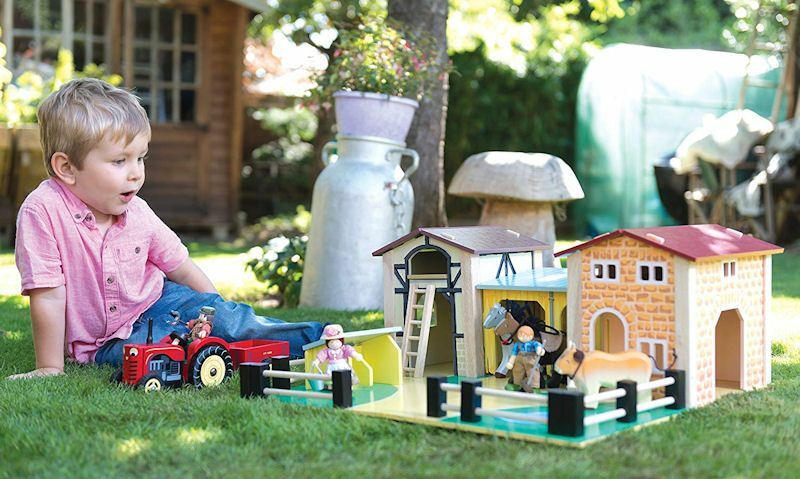 Rest assured, this is the wooden toy farm you've been looking for with the child's big farm animals, including Schleich, Pa po, Collecta, Bullyland and Safari Ltd. Yes, the Le Toy Van farm animals are a nice fit to and we recommend giving them ago, but big farm sets like this go well with the brands mentioned above, and that's a rarity. As common has it is now, Le Toy Van were one of the first to introduce slot-together sets and done so with this product for many years. Its made from a solid MDF construction with a printed surface and a little painted slashed on by hand. It features a pig sty, barn, cow house, stable and farmhouse. Complete with a farmyard base that come in two with a set of fencing to enclose it all in to one farmyard. Here we finally have a farm set based on 1:32 scale, meaning it will fit in with Britains and Siku farm toys in the same scale. Assembly is required but with very easy slot together design. Its colour theme is based on modern farm buildings with a milking parlour to the right, a big through barn to the left. Access to the farm happens through a big swinging gate to arrive on the self-enclosed farmyard, with the buildings taking up room. Big barn stands out on this set, though interestingly is a drive trough barn, meaning the tractor can pass through with no obstructions. The door on the yard leads to the milking polour, where cows can be lead out here or block it off so the cycle back to the cow shed located to the back, with a big opening for them to come and go as they graze. Keep the roof panels off if they are feeling a little restricted, but when play is taken outside the panels can be popped back on. Brushwood's follow up to their My First Farm come their latest release simply named, My Second Farm. Well finished in the same colour theme as before, the overall design is much different, this time featuring larger, taller buildings with access to the buildings coming from outside the farm yard. Again in 1:32 scale, it features a large silage clamp, tractor shed, loft, pens, swing gate and slurry ramp. The farmyard is made up of the silage ramps with a room to park a tractor or two, divided using a slot-in fence panels and the silage walls creating the boundary. 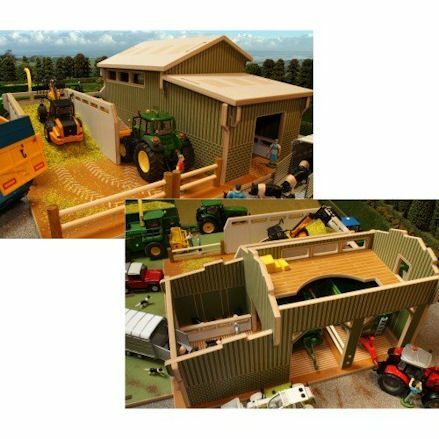 The single big farm building has two uses, the higher building is used to store your Britains or Siku tractors into two divided bay, with a storage space above. This is a dairy farm, so a space is left for them in the cow shed on the end. Both buildings can only be accessed from the outside, so more room is needed when setup. Bright and colourful are only the words you could use to describe this delightful self-assembly wooden toy farm set. Quickly lay out the baseboard and begin building up the barn and shed, connecting the wall and roof panels into the holes that require the corresponding slot joint. And boy, ain't it a nice playset once its up and running. Bigjigs would want you to go with there compatible accessories, but before you do check out Safari Ltd and Collecta farm animals, they are a little big but still fit within the set. The farm is confined to a farmyard with wooden slot-together fencing, so will be unrestricted at times, but this is a set that can be modified, so feel free to remove the boundary if they get in the way. There's plenty of room to keep animals in the interior, but the exits do need blocking off to prevent the animals running away. The top level is the hayloft where you keep the bales, and is accessed using the wooden ladder. Unrestricted access can be made to the interior by removing the unhinged roof panels. 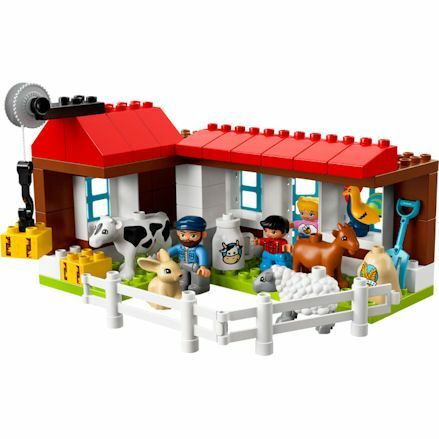 With an age range starting from two years, this Lego farm should get its few share of play over the years, with a recommended cut of age of 5 years. But this shouldn't stop them carrying on playing with the farm until they grow out of it. So out of the box, building the farm set is expected by a Lego set - we mustn't forget about that - but with only several big chunky bricks, they will be up and running in no time. Once built, they should be left with two farm buildings, that act as a farm when enclosed into a farmyard-like setup. Well any building can be used as farm shed for keeping animals, the second one is a farmhouse for the Lego people to live. Plenty of play will happen with the Lego tractor providing the wheels for traveling around the farm, with free rolling wheels and nothing mechanical stopping the fun if it broke. Lots of farm animals make up this set, with a cow, hen, sheep, goat and bunny rabbit. 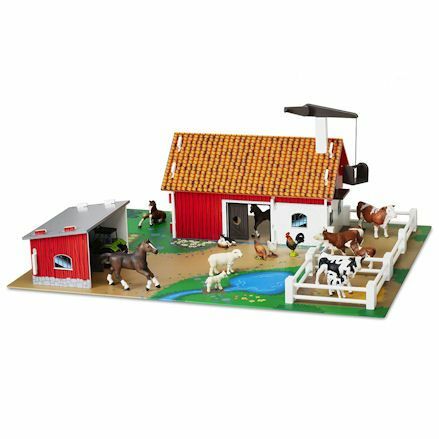 All that you could possible need to setup this Playmobil large farm right out of the box, and there's nothing new to add to the set, as everything you'll need to included. Well maybe a Playmobil tractor, truck or combine would be a welcome addition. 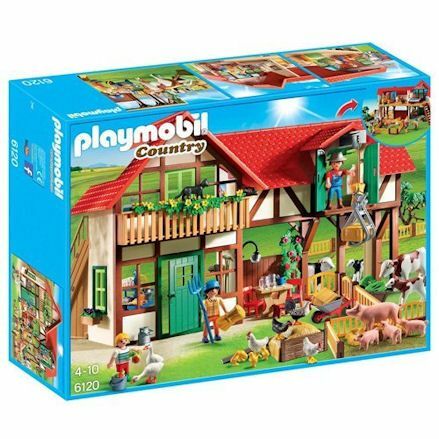 All in all, this large farm is available in the Playmobil 'Country' series, so you're free to add to the playset with toys within the same collection, be it farm related or similar. They will sure stay busy with this large farm set regardless, this is due to the interaction the main farm building has to offer, including multiple rooms and areas. And well play can happen from both the front - which acts as the outside - or back, which is the interior of the farm, complete with home furnishings, play can happen all around. Most young farmers will be drawn to the working winch that takes up items to the storage room above, and below this hayloft is where you keep then animals undercover. There's lots of farm animals to keep up interest, with a family of figures to run the farm, fencing to make pens, and a few home comforts. Playmobil take along farm is just that, a simple fold away playset that holds all the accessories, then packed away safely. The selling point on this set is the 'take along farm' meaning it can be carried anywhere due to the carry handle fixed to the roof. 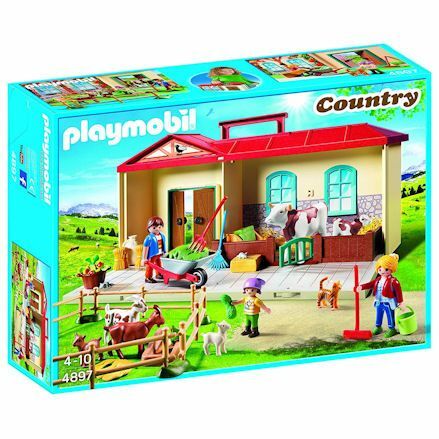 Before they can carry it away, the items included with the farm set must be packed within the farm, including; the Playmobil figures, farm animals, fencing and accessories. Then the extended flooring that pop's out is then closed back up like a draw bridge. But here's the clanger, failing to secure the floor when in carry mode will result in the flooring panel folding back down and spilling the toys. But once all setup, you'll have yourself an interactive farm, with and opening door, a gate that leads to the animal pen, farm figures to take care of the goats, cow and calf.